Plus Size Convertible Pants are pants that can be shortened to capri pants or shorts with zip on & off sections or buttons tabs that let you roll up the bottoms. Originally this style was seen in athletic wear, but is being seen more and more in women's casual plus size pants. The casual fashion pants most often have a tab and a button, where the hem of the pants can be rolled up and secured with the tab and button. The athletic and activewear styles will almost always have the zip on and off sections. They can be a very practical choice if you are going to be involved in an outdoor activity where the temperatures may fluctuate throughout the day - when it might be too cool in the morning for shorts, but too warm in the afternoon for long pants. This is a style that is most suited for warmer weather. 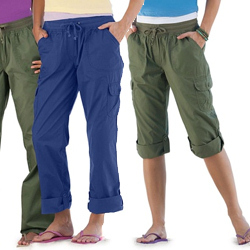 This spring and summer we are also seeing convertible capri pants and convertible shorts. I'm not sure yet if this a just a trend, a fad or if they are here to stay, but there are available this season. If this trend continues to grow in popularity, I expect we will see more and more style and fabric choices, like denim and hopefully they will become a bit more stylish. Although this year's selection is light years ahead of any before.